Marc Marquez (93). Photo by Brian J. Nelson. "I honestly can't explain the two crashes. All I know is that they were identical and that is why we need to see the data to understand what happened. The feeling was not the same as on Friday. I am still confident because this problem only occurs in two corners and in the rest of the circuit I feel very fast. I just hope that tomorrow there will be no strong wind". "The wind during the Q2 was really strong and it was very difficult to make the perfect lap. All things considered we did a very positive qualifying and that's why I'm satisfied. Tomorrow it won't be easy to choose the tyres because we had not the possibility to make enough laps today. We are starting from a good position and there is a lot of confidence". •Joan Mir happy with progress and ready for the race. •FP3 cancelled as lightning strikes circuit. "We could say that the cancellation of FP3 completely altered our plan for today. We tried something different with our setup in terms of weight distribution, but really I was only able to test it out in Q2 as that was the only fully dry session; the mixed conditions in FP4 didn't allow us to draw any conclusions. It was good for us, but not for the feeling of the bike, because we couldn't push it to the limit and it wasn't a true demonstration of our potential. Unfortunately, I had to discover that it didn't work as we expected in Q2. We finished tenth, which isn't bad. The warmup will be very important for getting our feeling back and improving a little more. In the race, we will have to get a good start. Tomorrow it will be important to have the feeling I had yesterday -or better." "It was a day of very complicated weather conditions. We went out for FP4 with wet tyres, but the track was partially dry in places, so it was difficult to understand the best way to ride. We started off with a full tank and were not very confident. Going into Q2 without 100% confidence is not ideal, but finishing ninth is a good result: It's a spot on the third row, so I'm very happy with the work that we've done at this difficult circuit. I know that it is a very demanding track over 20 laps, but we have a good pace - not like the front-runners have, but we are well placed to fight for the Top 10 and to be the top rookie. The main thing is to enjoy the race." 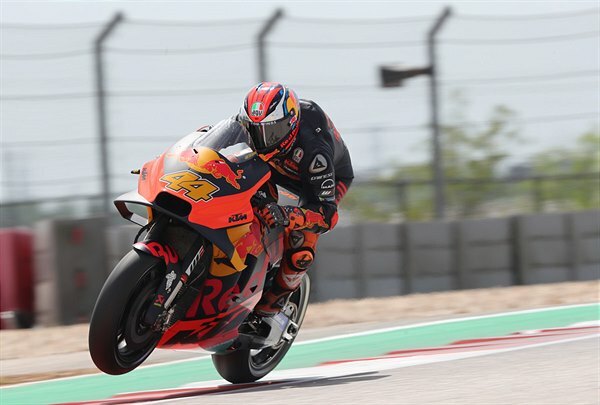 Mixed weather conditions ensured Takaaki Nakagami endured another demanding day at the Grand Prix of the Americas on Saturday. Having finished down in 15th position on Friday, the LCR Honda IDEMITSU rider was denied the chance to secure automatic progress to Q2 when FP3 was cancelled due to a thunderstorm and lightning. Instead Taka had to battle it out in Q1 alongside the likes of Jorge Lorenzo and Andrea Dovizioso and eventually finished that session in fifth position. It means the Japanese star will start from the fifth row of the grid in Sunday’s race and he admitted afterwards it had been a disappointing weekend so far. “I think the weather made it really complicated for everybody. Yesterday we finished outside of the top 10 in P15, then FP3 was cancelled so we didn’t have any further chance to improve (ahead of qualifying). FP4 was in mixed conditions and at the end of the session we tested with slick tyres to prepare for Q1”. Cal Crutchlow continued his impressive start to the 2019 season as he secured a place on the front row for Sunday’s Grand Prix of the Americas in Texas. The LCR Honda CASTROL rider – who is sponsored by Flex-Box this weekend – is back on the front row for the first time since Assen last year after he claimed third position in Q2 behind Honda colleague Marc Marquez and Valentino Rossi. Thunderstorms and lightning saw FP3 cancelled on Saturday morning, but Crutchlow then impressed on a damp track in FP4 as he finished second behind a dominant Marquez. He was again on the pace during Q2 and, while not totally satisfied with his performance, the Briton is delighted to have put himself in a position to challenge for the podium once again this weekend.